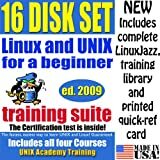 Linux and UNIX for Beginner is an outstanding training and self education resource that contributes to a significant progress in a shortest time. This panoramic suite contains all four courses of renowned training collection and the opportunity for four UNIX Academy Certifications. It is the only DVD course on the market today that has been developed by a professional, top-ranking career system administrator. AVIA Professional (AVIA Pro) is a multi-disc calibration, set-up and test suite from Ovation Multimedia. The suite consists of seven DVDs plus a user manual designed to be an all-inclusive product for the calibration of video and audio systems. AVIA Pro is the most technologically advanced product for use in the professional and home theater environments. The contents include state-of-the-art audio and video test signals from Ovation Multimedia, as well as industry standards from CEA and other materials from SMPTE, RPG and Genesis Microchip. The printed manual provides necessary instructions for the use of each disc.